Born in Jersey in 1946 where he still lives and works. Editioning his own etchings and now has 400 of which only a small percentage are currently available – due to high demand. Michael is married and has two grown-up children – Alexandre and Ellenore. Elected to the Printmakers Council of Great Britain when he was still in his early twenties, Michael is today admired as one of England’s most established printmakers. Following graduation from Portsmouth College of Art in 1965, Richecoeur was admitted to the world-renowned Slade and Royal College of Art – choosing the latter, he received a Master’s Degree in 1971. 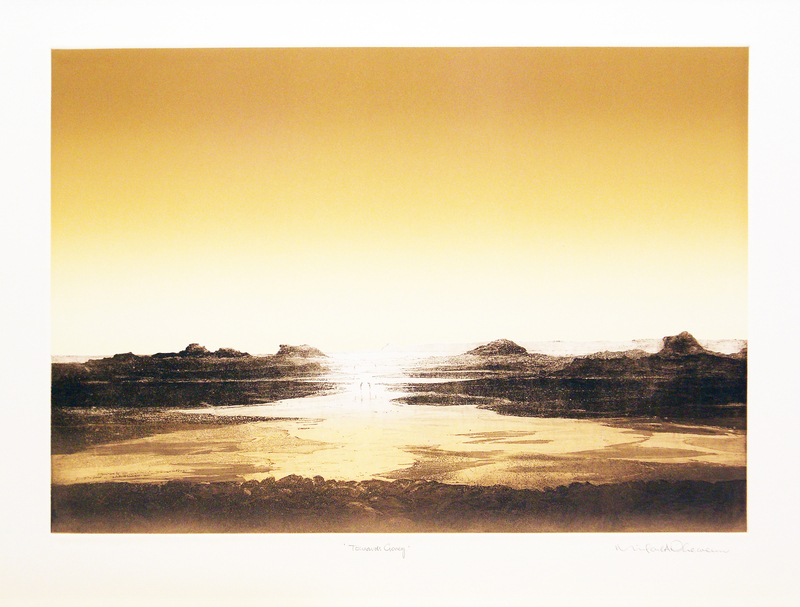 A further offer of a Fellowship at Yale University in 1970 completed Richecoeur’s training and provided enriching experience in the medium of his speciality – colour etching. 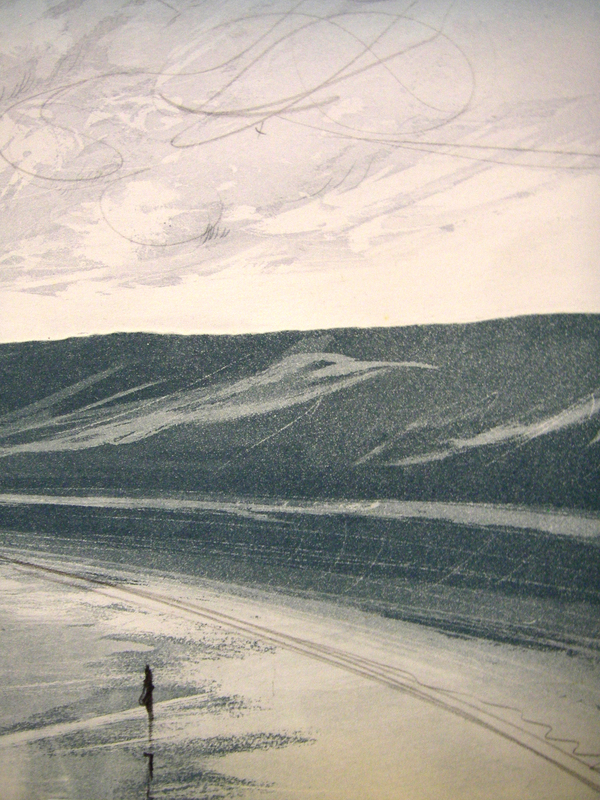 RIchecoeur’s impeccable intaglio technique and the gentle, oriental mood of his landscape subjects have met with considerable praise from collectors worldwide who provide an enthusiastic audience for his new etching work. After graduating from RCA he returned to his native Jersey where he has established a fully-equipped working studio. From student to practising artist he has always had a pre-occupation with his surrounding landscape. Although Michael expresses himself in all mediums it is etching that he finds most ’empathy’. Enjoying and revelling in the technical problems which are inherent in this technique – striving to extend the possibilities and boundaries of what can be achieved. The great majority of his prints are inspired by the landscape which he has studied and to which he adds his very individual feeling of mood which is superimposed upon the straight-forward contours of the chosen landscape. There is also a slightly surrealist humour in some of his work which is often accentuated by the titles which he gives i.e. ‘Too Late for Church’ – an illustrative image of two drunks staggering down a steep back street. While at the RCA, Michael studied Philosophy and Cultural Anthropology but was particularly interested in Oriental methods and approaches to the subject, primarily comparing these to Western Art. But in Western Art, landscape has been used in many ways – symbolically, allegorically, romantically and as a mere background to a foreground subjects, and so on. It has been said that Richecoeur’s approach to the landscape has more in common with the Chinese concepts than with Western ideals. As a generalisation, it could be said that Europe was preoccupied with the painting of the outside of subjects – whereas China was trying to express the inside of a subject. The Art springs spontaneously from nature and this is what Richecoeur achieves in his work. He believes in the force within natural phenomena and although inevitably the outer image is the starting point of his compositions, the internal essence is essentially important. This belief is coupled with the basic belief in order and harmony (life and breath) in nature which, in turn, leads to the realisation that there should also be order and harmony with the techniques used and in the colours expressed in a work. Whilst at the RCA his tutors included: David Hockney, Elizabeth Frink and Patrick Proctor and the photographers John Hedgecoe and Michael Langford. During the mid-eighties Michael’s work attracted the attention of the Crown Prince of Mohamed Bolkaih of Brunei when he purchased a substantial number of etchings from a gallery in Illinois. He was also involved with Sir Hugh Casson (a past President of The Royal Academy) and Lady Casson in textile commissions for Harrods of London. His work is used extensively by global finance companies in their graphic products for world wide distribution. 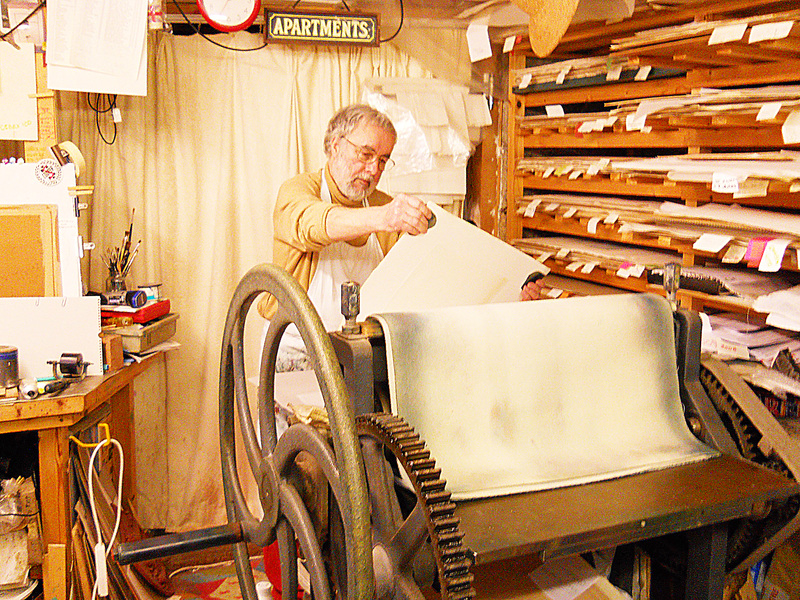 He prints his own etchings with a Hunter Penrose Press, using French Waterleaf (unsized) paper. 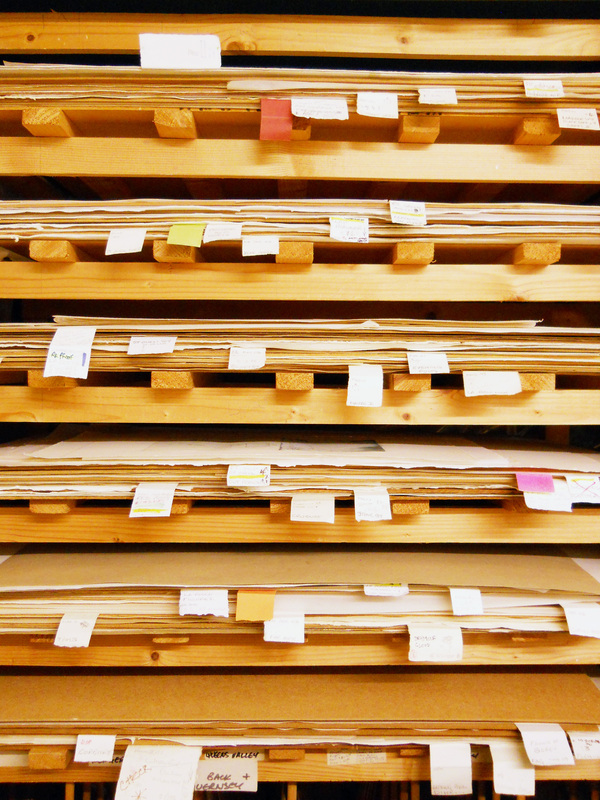 To ensure consistency of quality and colour, each print is withdrawn from the press with a single pull. The supply is limited and rarely exceeds fifteen images a year. What has he been doing recently? Maintaining the supply of original limited edition prints which are being ordered from clients worldwide. Working with a French publisher on a book ‘Richecoeur Impressions’ together with three exhibitions in Normandy this summer. As Michael prints every print himself, some 20,000+ to date, he is in his maturing years taking more leisurely pursuits, as he calls them, of painting commissions and especially enjoys the challenge of large scale watercolours. Since the early seventies Michael has had all his work published in limited editions. Several hundred different images have been created in his Jersey studio when he prefers to work ‘far from the mainstream of contemporary art’ and he says ‘isolation from any commercial or fashionable influence’. BRITISH COUNCIL TRAVELLING EXHIBITION. STATE OF NEW JERSEY ART COLLECTION. BARREAU ART GALLERY – JERSEY. HERBERT GALLERY – OXFORD. INTERNATIONAL GRADUATE PRINT EXHIBIT – USA. CAPE COLLEGE – SOUTH AFRICA. GUERNSEY MUSEUM AND ART GALLERY. TRENT UNIVERSITY – ONTARIO. WINNIPEG ART GALLERY. DURBAN ART GALLERY. UNIVERSITY OF OTTAWA. LUTON MUSEUM AND ART GALLERY. UNIVERSITY OF VICTORIA. HULL COLLEGE OF ART. READING MUSEUM AND ART GALLERY. CAPE COLLEGE OF ADVANCED TECHNOLOGY – SOUTH AFRICA. SOUTHEND MUSEUM. BRISBANE COLLEGE – AUSTRALIA. WEST GLAMORGAN MUSEUM. MOORHEAD COLLEGE OF ART – PHILADELPHIA. IMPERIAL COLLEGE – LONDON. UNIVERSITY OF YORK – TORONTO. EAST LONDON TECHNICAL COLLEGE. SOUTH AFRICA NATIONAL GALLERY. AUSTRALIAN NATIONAL UNIVERSITY ART COLLECTION.